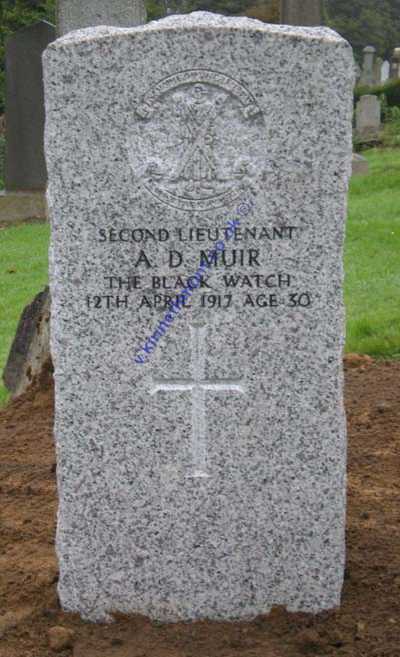 The CWGC headstone is to be erected in the month as Mark Duffy and others from thsi site identified that 2nd Lieut ALEXANDER DALE MUIR , 6th Bn BLACK WATCH died in Perth on 12 April 1917 and his grave has not yet been recognised as a War Grave casualty . Iain Anderson, Regional Supervisor Scotland has reported that 2nd Lt Muir's headstone will be erected shortly at Perth Wellshill Cemetery at Parochial 2 Section E lair 11 . There may be a Black Watch Association ceremony at the graveside in due course arranged by Major Ronnie Proctor MBE in conjunction with Iain Anderson of the CWGC . Mark Duffy who did the initial extensive search to prove this Officer was a CWGC casualty has been informed of this update . Thanks also go to Jim Grant in Aberdeen for his assistance in this Officers research and I will keep you all posted on any updates I get from the Black Watch Assoc and the CWGC and hopefully any family members traced and invited as there will be family living Canada as well . The CWGC headstone erected over the grave of Lt. Muir on 27th September 2010.